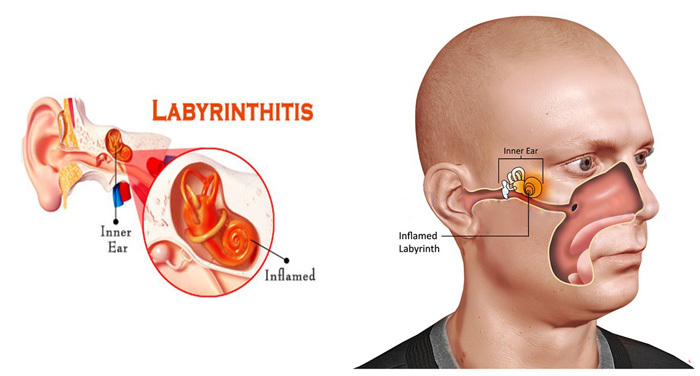 Labyrinthitis is a purulent or non-purulent inflammatory process in the inner ear, which is caused by an infection or injury. Most physicians consider labyrinthitis to be a kind of otitis (inner otitis). Labyrinthitis causes vertigo, imbalance, lack of coordination, and partial or complete loss of hearing. Depending on the cause and stage, a doctor can prescribe pharmaceutical or surgical treatment. Many patients have to undergo post-treatment rehabilitation, and some need hearing aid. Because the inner ear is separated from the middle ear, the only possible source of infection is another site of inffection in the body. Bacteria and their toxins penetrate into the labyrinth and infect it. Most commonly, labyrinthitis is caused by otitis media, which affects the middle ear. The condition makes the membranes that protect the labyrinth penetrable for bacteria, and the disease progresses. Also, the labyrinth may become vulnerable due to damaged eardrum. This refers to eardrum injuries, temporal bone fractures and cranial injuries, which result in secondary damage to the eardrum (ruptures). Traumagenic (due to a complicated ear or cranial injury). necrotic (occurs due to poor blood flow in a particular segment of the labyrinth resulting from thrombosis or constriction of auricular artery branches. It can result from an auricular artery injury or from its constriction caused by edemas). chronic (symptoms develop gradually; it can take on a latent and almost asymptomatic form). hearing loss (reversible in case of serous and irreversible in case of purulent labyrinthitis). The disease may start with mild symptoms, which become more intense over time. At initial stages vertigo may occur only if you turn your head sharply or move intensively. 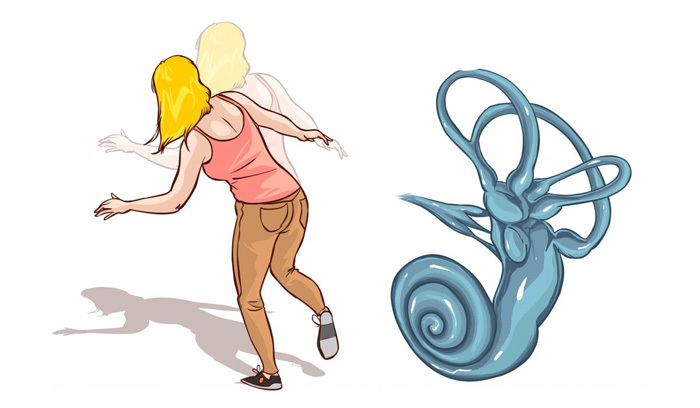 However, it may get worse over time, and you may find yourself unable to move without help during attacks. Symptoms, particularly vertigo, appear one or two weeks after the recovery from the infection (bacterial or viral) that has contributed to labyrinnthitis. 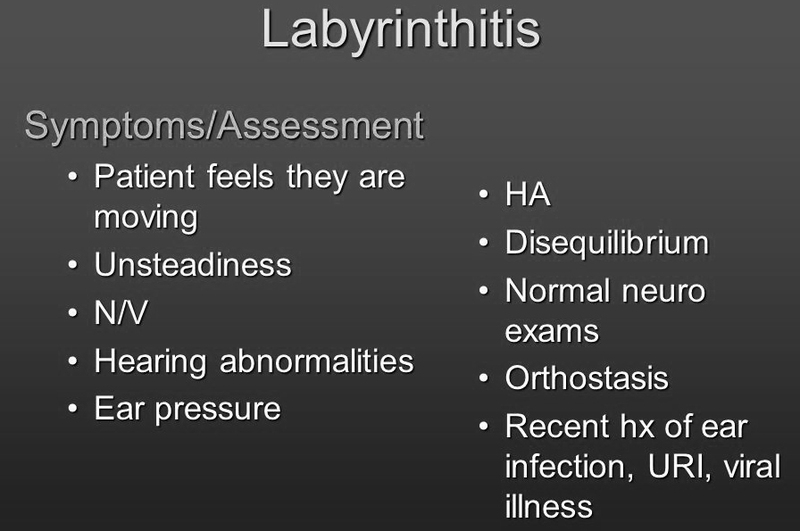 Purulent labyrinthitis causes hyperthermia, sometimes severe. Purulent labyrinthitis is the most dangerous type in terms of complications. Labyrinthitis should be diagnosed by an otolaryngologist. However, if there are underlying diseases or labyrinthitis symptoms are not pronounced, an infectious disease doctor, venereologist, traumatologist, neurologist and other specialists can be invited. Otoscopy/microotoscopy (detection of possible perforation of the eardrum). bacteriological study of ear discharge. These additional diagnostics methods, as well as lab tests, are aimed at differentiating between labyrinthitis from other diseases that cause similar symptoms, such as otosclerosis, acoustic neuroma, Meniere’s disease, ataxia, cerebellar abscess, cochlear neuritis, etc. Therapy should include a complex of conservative (pharmaceutical) and surgical methods, and their choice directly depends on the characteristics and severity of underlying illnesses. Specifically, attacks may require symptomatic therapy, while other cases necessitate continuous therapeutic treatment followed by hearing aid. For example, most purulent labyrinthitis cases are treated surgically, because they require complete sanitation of the labyrinth. In severe cases, the organ has to be removed. It must be remembered that acute symptoms of labyrinthitis (especially serous) are easy to treat and mostly end in complete recovery. Purulent labyrinthitis seriously impairs hearing and vestibular functions. However, even severe disorders can be treated successfully (using natural, compensatory, and medical methods). Labyrinthitis requires inpatient treatment. Labyrinthitis is a kind of disease, which, if treated properly, end in almost complete regaining of hearing and vestibular functions. However, lack of due care (especially in case of purulent labyrinthitis) can lead to severe complications and death.